At last Irish (Gaelic) without confusion! A new teaching CD that really works. 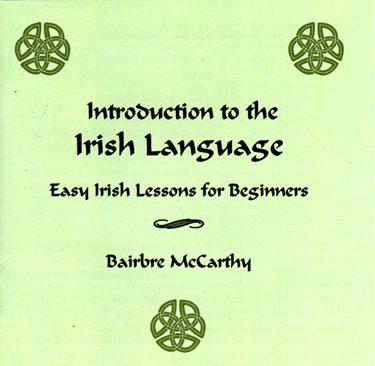 Bairbre McCarthy has taught Irish language for many years and developed this course in response to difficulties students encountered with other methods. •A 53 minute audio CD and 16 page booklet. •Easy to use booklet, complete transcript of CD. •Sound/sight coordination makes learning a pleasure. •Suitable for individuals or classrooms. Perhaps some day you might come across a leprechaun playing his trade, sitting cross-legged with a tiny hammer in his hand and working on a fairy shoe. You will be glad you have heard these stories then, for rather than grab him and rudely demand his gold and end up with a pot of soup stuck to your nose, you will treat him gently and with the respect he deserves. Then, perhaps, he might lend you his magic purse, make you boots that last forever, or serve you a tasty dinner every evening till the end of your days. These cautionary tales are set in a world populated by giants and princesses and will capture the imagination of children of all ages. This is an audio version of the book The Keeper of the Crock of Gold, read by Bairbre McCarthy. Featuring background fiddle music by Maura McNamara. Favourite Irish Legends includes three of the most famous Irish legends: "The Children of Lir," (Leanaí Lir), "Balor of the Evil Eye," (Balor Drochshúile) and "Wooing of Etáin," (Tóraíocht Etáin). 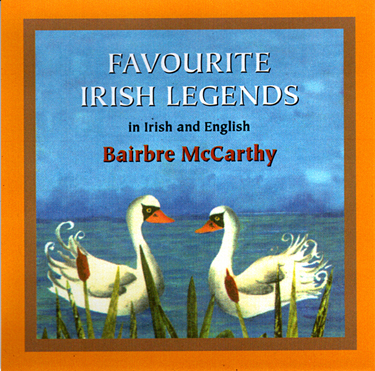 This CD is a unique introduction to the legends, bringing them to life both in Irish and English. In the oral tradition of Old Ireland, the storyteller served as the local historian, composing stories to record all important events. Musicians wrote and arranged music to accompany the performance of these stories. This ancient tradition is continued by Bairbre and fiddler Frank Orsini on this CD, with the presentation of these three epic tales, in Irish and English.